Puerto de la Cruz holidays are a real Canarian delight, with stunning scenery, a wealth of great restaurants, a great seafront Lido and a fantastic choice of places to stay. The dramatic mountainous backdrop is breathtaking as is the craggy coastline here on the north coast of Tenerife. There are three beaches to explore during holidays to Puerto de la Cruz and the main one is around 1 km long and has fine black volcanic sand with waves that windsurfers just love. The sunbeds are backed by stunning tropical gardens with waterfalls, sun terraces with bars and restaurants. 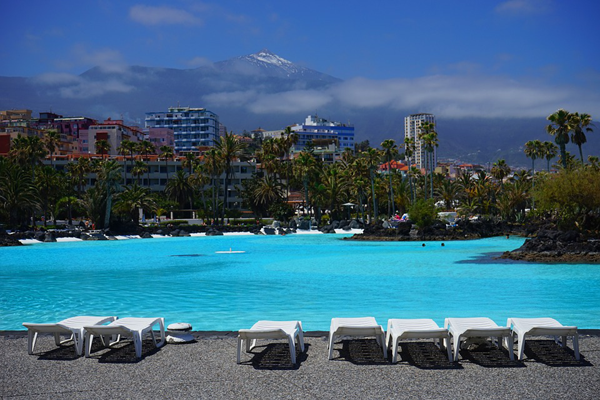 The famous saltwater Lido’s are also popular for a day enjoying the sun and were designed, along with the tropical gardens by the Canarian architect César Manrique. The Lido’s includes 7 pools, tropical plants and trees, a huge fountain, jacuzzis, playground, restaurants as well as an underground casino and dance hall. Puerto de la Cruz is a very cosmopolitan resort that has a great range of places to stay, an impressive number of good restaurants, lively bars and a pretty old town complete with a harbour. Day to day life in the resort is much more laid back than its busy counterparts on the southern coastlines. The botanical gardens on the outskirts of town offer a fabulous array of tropical shrubs and plants and make for a colourful day out. Santa Cruz de Tenerife, the islands capital is only a thirty minute drive away and offers a great opportunity to pick up a bargain in the designer shops or explore its flea market on a Sunday. An equally popular day out is to the impressive Mount Teide, at 3718 metres is actually the world’s highest volcano. Holidays to Puerto de la Cruz can be as laid back or busy as you like and are available from most UK airports all year round. For a huge choice of deals call one of our Tenerife travel experts today or have a browse at our search and here at JLM Travel we aim to get you the best possible holiday options.